« Stenting can convert a stable plaque into a vulnerable plaque . . . True or False ? How does thrombus look like in coronary angiogram ? It is a fashionable topic in cath meetings and workshops to discuss about thrombus loaded coronary arteries. Still visualizing a thrombus in coronary angiogram is never a mean task ! It needs lots of visual acuity and imagination to recognise intra coronary thrombus. A lesion which looks fresh with multiple layers of irregularity within the lumen is often assumed to be thrombus. Both are radiolucent . But a thrombus or a plaque coated with dye will make it radio opaque. The radio opacity of a thrombus is determined by extent of dye coating , the thickness of the dye layer, obliqueness to the x-ray beam . A thrombus plaque interface can have two different planes of densities. This is still more complex . Both can have a filling defect .A flap is a line like filling defect To complicate the issues further, both thrombus and dissection occur together in the same spot . 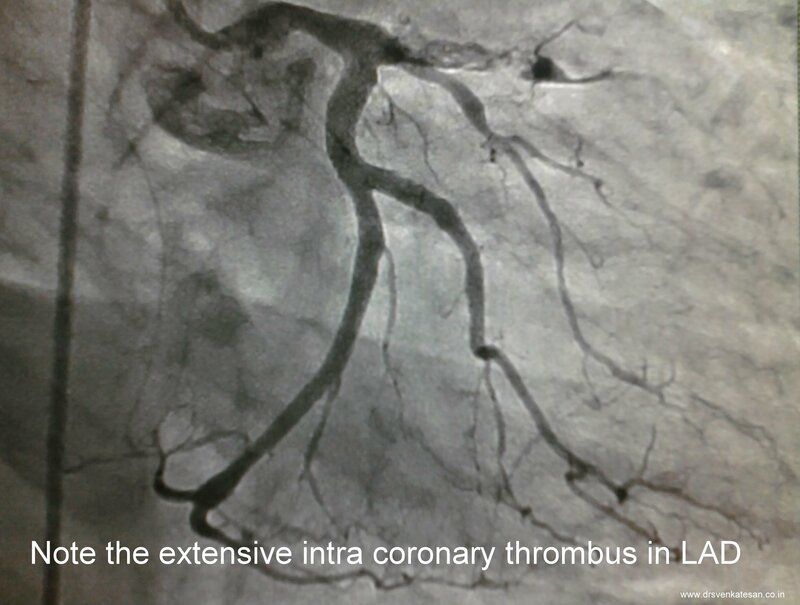 How confidently one can identify a thrombus in coronary angiogram ? During acute MI there is no difficulty in identifying it , as every acute obstruction must contain some thrombus* . Some interventionists have special ocular sense to detect thrombus. Few others rely on their intuition rather than solid evidence. Sucking out a thrombus during primary angioplasty has now become standard concept and is indeed feasible in most situations. It is obvious we have a task on hand to identify thrombus correctly and quickly during primary PCI /UA . Blind suction, even though rewarding should be avoided. Caution is required as blind suction pulls a plaque with force ! A plaque debri with a thrombus, a dissected flap all can combine together to produce a complex “masala” of coronary lesion especially after a difficult guidewire cross . This is refereed to as a battered coronary artery .These are the lesions which are prone for recurrent acute or sub acute thrombosis even if the lesion is stented properly. * Diagnosing thrombus in a chronic lesion is much . . .much difficult ! Thrombus may be a key finding in acute coronary syndrome (Of course the contribution of fissure, injured , plaques to the lesion can never be underestimated . ) Still , we have no simple , accurate method to identify it ( Forget quantifying it) . Lots of assumption , guess work and gut feeling is at play in the cath lab . We expect better online , real time tools to improve out tentativeness inside the coronary artery .